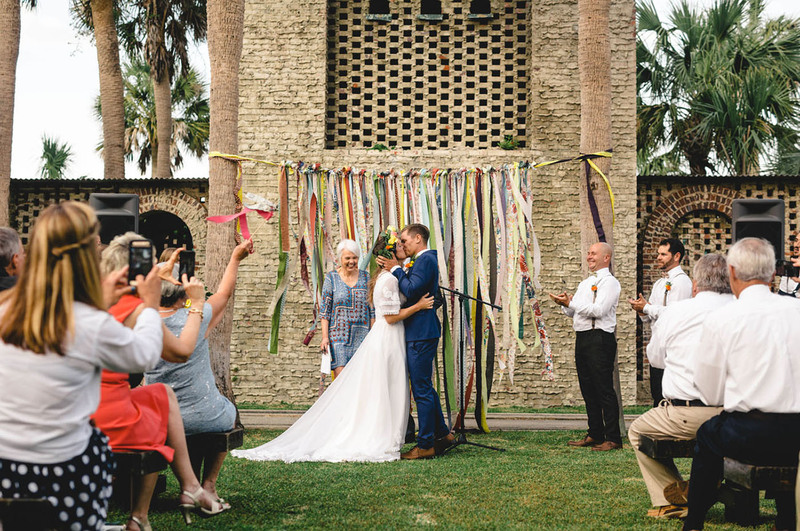 We’re all for a good “Meet Cute” story and Lauren + Ryan’s is nothing short of that! 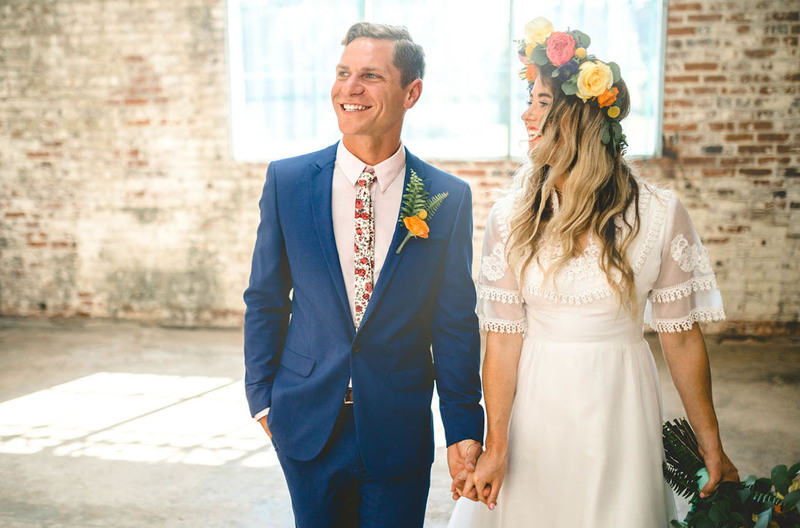 It all started when Lauren made a major move to Myrtle Beach, South Carolina for her job at a local college… She wanted to immerse herself in the beach culture + immediately went out searching for a new surfboard. When she walked into a local surf shop, she fell in love with a shiny pink surfboard. The guy that sold it to her? Oh, he’d just turn out to later become her husband!! His name was Ryan. Little did Lauren know, but her interaction with Ryan would make such an impact on him, that he remembered a key detail — she frequently met up with her students at the Starbucks on campus. So for the next year and a half, Ryan intentionally walked through Starbucks to get to the library, hoping he would run into her (so sweet, right!?). 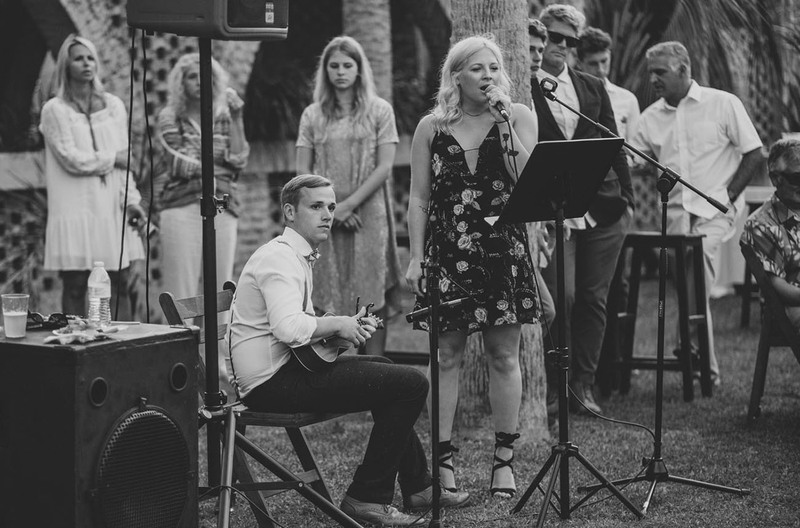 Here’s Lauren with the rest: Well, his ploy didn’t work… But somehow our stars aligned. A year and a half later, I’m scrolling through my Instagram explore newsfeed. I came across a (random) photo of a guy surfing at a local beach and thought to myself, “Wow, I wish I was out surfing like that guy.” As I clicked on the stranger’s profile, I realized I knew him. This surfer stranger ended up being Ryan — the cute guy who sold the surfboard to me at the shop! After unintentionally “running into” Ryan on social media, I boldly slid into his DM (Direct Message) and we started dating. 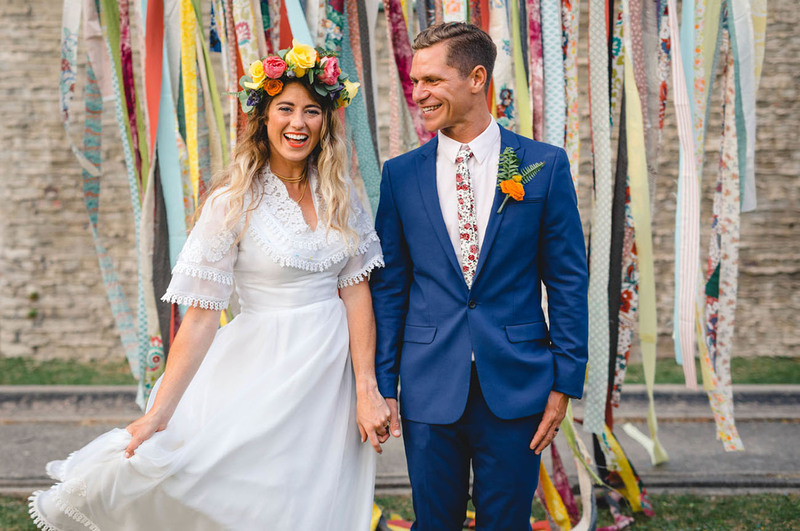 For their big day, they DIYed so many different aspects to bring their vintage meets garden party idea to life. 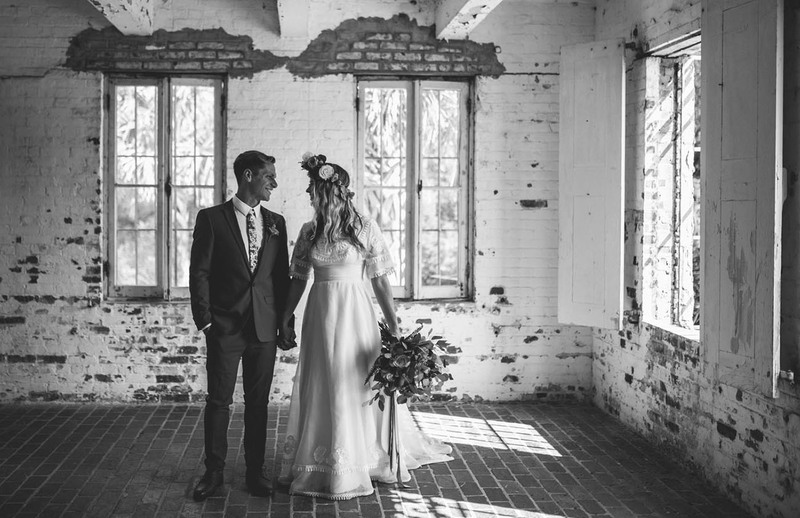 Lauren shares We didn’t have any specific colors because we may have just adopted all the colors… Ryan and I both have vintage hearts and together we are intrinsically creative. 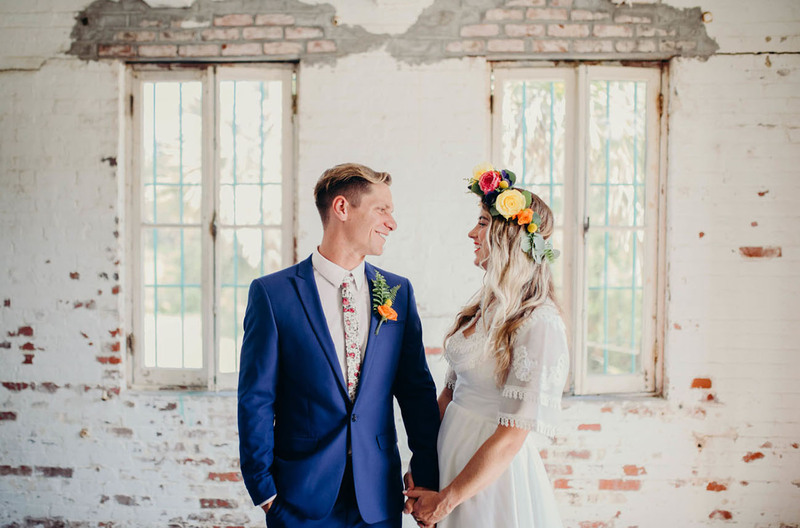 I found a 1970’s vintage wedding dress that would go perfect with Ryan’s royal blue suit. 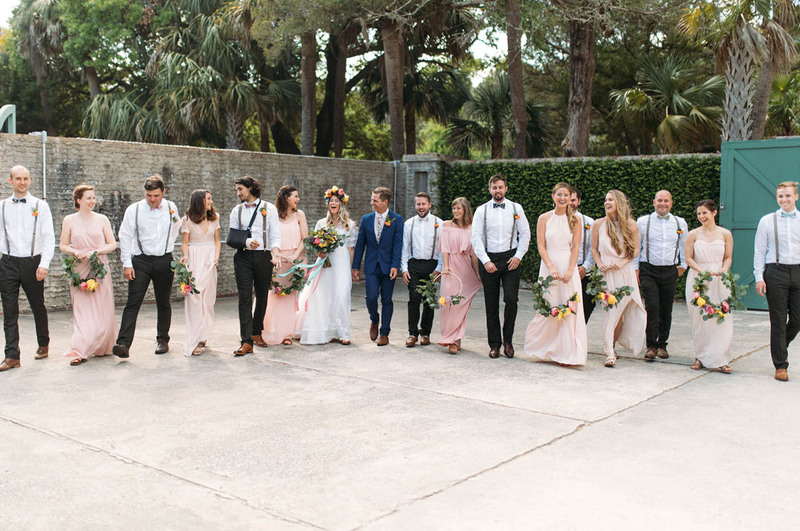 The bridesmaids carried floral hoops and the groomsmen rocked suspenders, olive colored pants and floral bow ties. 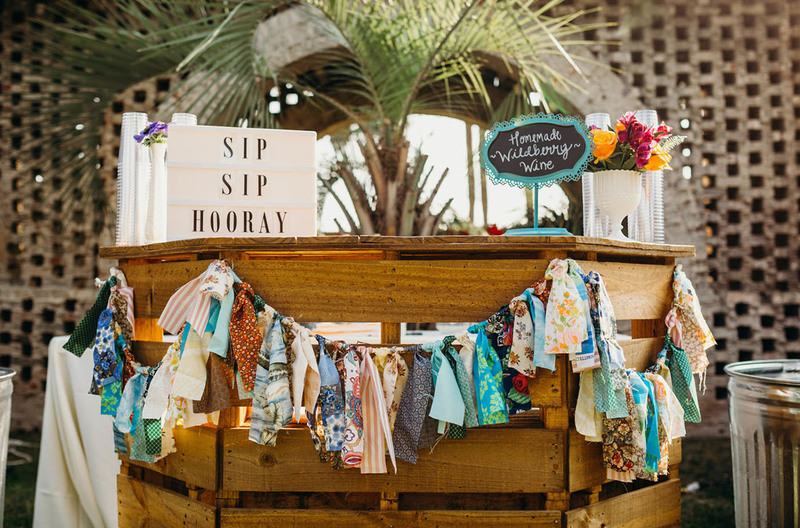 We spent hours making over 100 feet of fabric bunting, giant letters that spell ‘CHEERS’! Fun, festive, and celebratory — just the way we like it. Ready to see all the DIY magic captured by Valerie Demo? 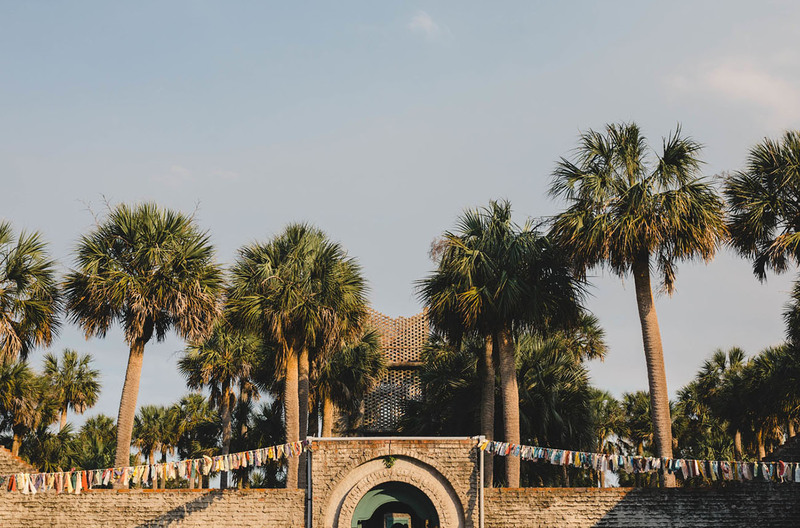 Let’s head to Atalaya Castle at Huntington Beach State Park in South Carolina!! 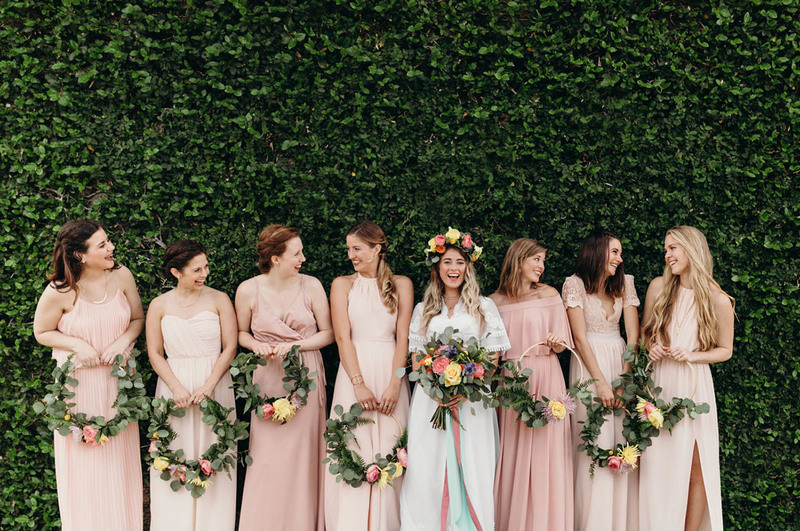 To start off, how darling are those floral hoops by Joy In Bloom Floral for the bridesmaids?! 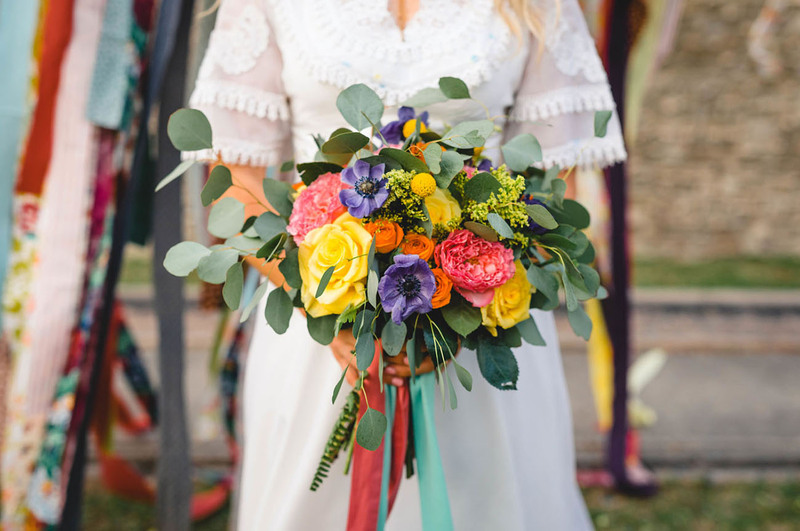 And if you love them as well, we have a DIY tutorial with silk flowers so you can make your own!! 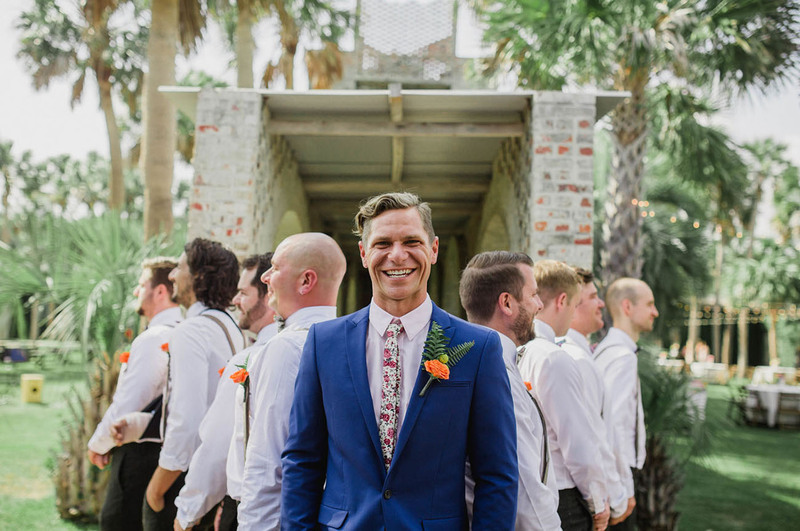 The groom rocked an incredible blue suit from ASOS… And can we give him a round of applause for that floral tie?! What a winning combo!! 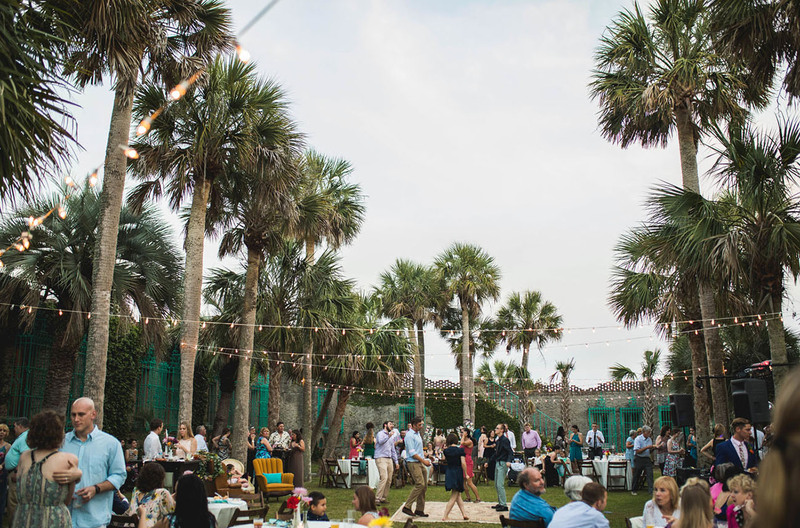 About that epic venue… This is the dreamy Atalya Castle — located in South Carolina. 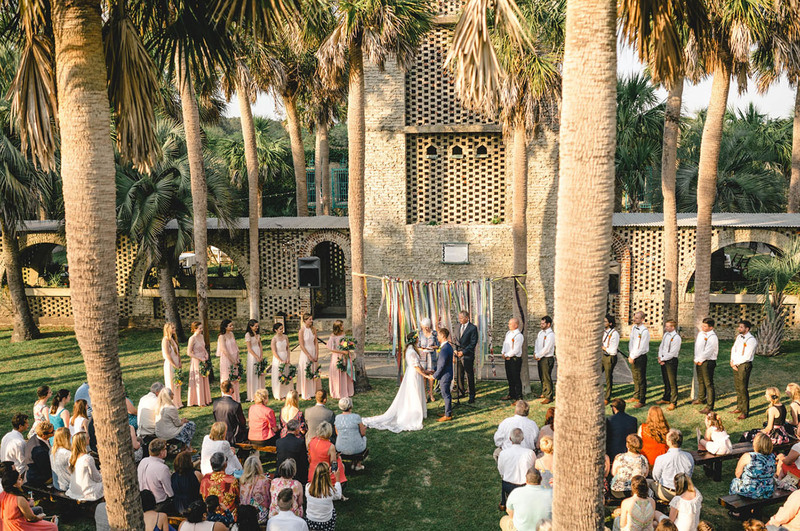 This 1920’s summer home resembles a Mediterranean coastal villa and is lined with palm trees and just the right amount of ivy and textured, chipping walls. 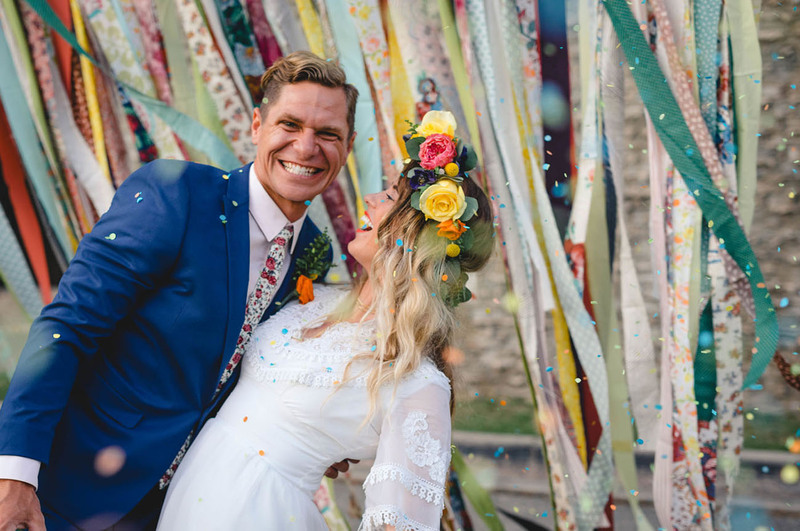 L+R spent hours making buntings out of vintage fabric which decorated the entrance and served as a backdrop for their ceremony. 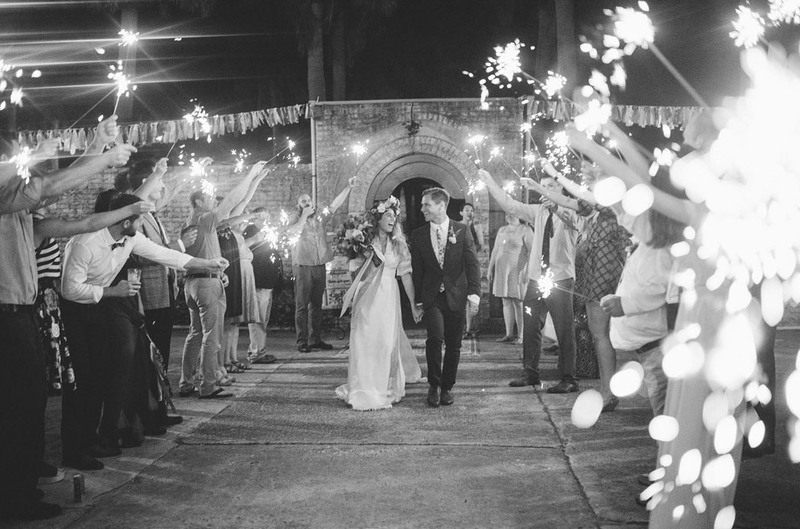 Lauren: Being pronounced as husband and wife and walking down the aisle with our guests cheering and celebrating us! 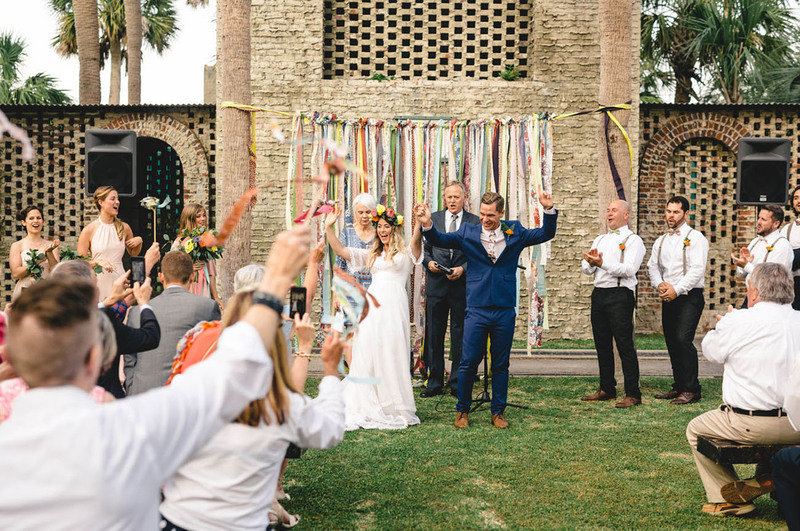 Ryan: The first dance + the epic dance party that ensued! 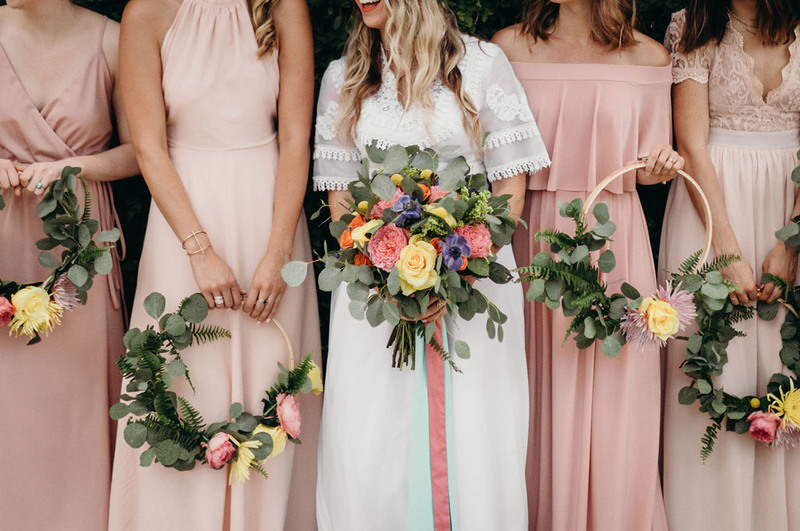 Her dress? Vintage!! She scored it on Poshmark. The two DIY-ed almost everything, including: the pallet bar, all of the signage, a huge “cheers” sign, and repurposed almost everything else. They thrifted vases for the tables, refinished an old desk for their cake table, and even had a friend make homemade wine for the day. 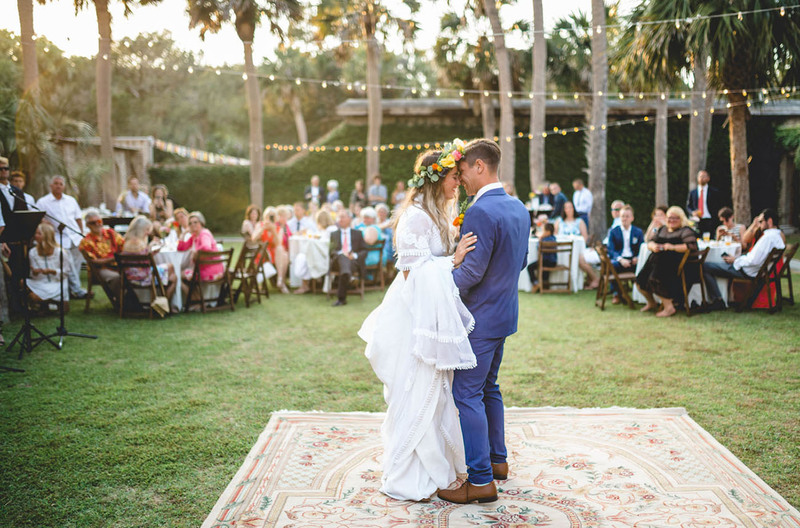 They searched craigslist for a vintage rug and finally found the perfect piece: a 10×15 Victorian style rug, which they used as their dance floor. Talk about creative! 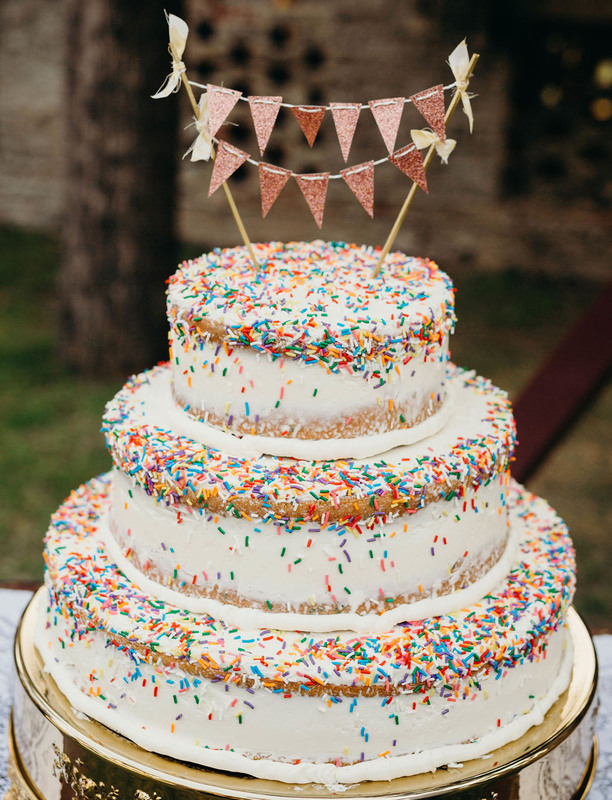 A funfetti, confetti covered three-tiered cake? Yes, PLEASE!! This one was crafted by pastry chef, Brian Bailey. So fun, you two!! Thank you for letting us in on all the magic, L+R. Congrats! !